You are on the "Contact Us" page of a corporate website that has the contact address and the phone number of that company. Now how do you deal with this information ? Enter Schmap Local, a free-plugin that will recognize the highlighted address on the webpage and can call the listed phone number using Skype or show you the driving directions via Google or Yahoo! Maps. You can even forward the address information to someone else via email or SMS. 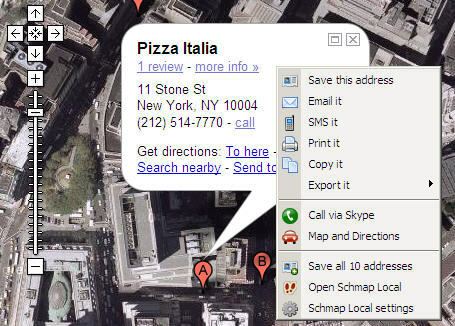 Schmap Local also a recommended browser add-on for anyone who uses services like Google Maps, Yahoo! Local, AOL YellowPages or MapQuest for finding local businesses in their neighbourhoods. Schmap Local is available for IE as well as Firefox. Say you are on the Google Local Maps website searching for pizza restaurants that are located near Battery Park in Manhattan, NYC. Google Local shows a long list of businesses with their addresses, phone numbers and even some reviews of the restaurant. There's also an option to directly call the pizza store from the Google website or you can SMS the restaurant's address to any cell phone. Schmap Local let's you do more - you can save all these addresses and phone numbers in one step, forward them to an email address or call the business phone number directly via Skype. Schmap Local - Save addresses and phone numbers on the web.